Sports and underdog movies go together like peanut butter and jelly, like salt and pepper. As a sports fan and a moviegoer, there’s something warm and inspiring about those stories of people who just shouldn’t be able to do what they do. Are they box office gold? Not usually, but they often enough find their niche with audiences sooner rather than later. 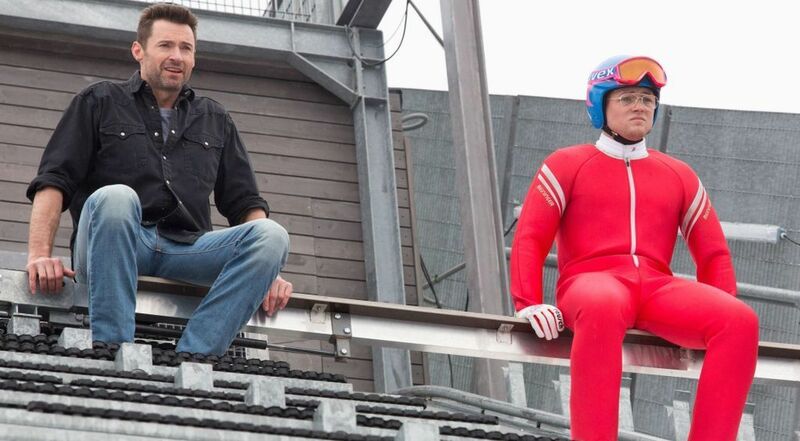 The latest entry into the underdog genre is a good one, Dexter Fletcher’s “Eddie the Eagle”. 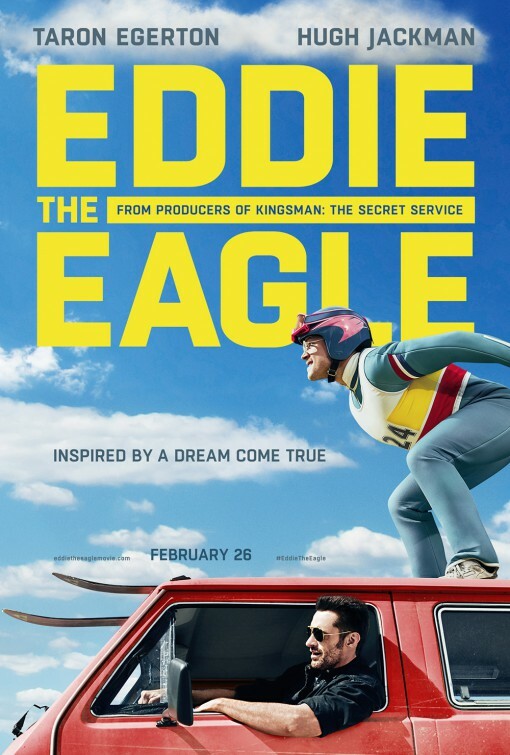 It’s the late 80’s and Eddie Edwards (Taron Egerton) is a 22-year-old Brit who’s always had one dream – he’s long wanted to be an Olympic athlete. He’s overcome some physical ailments growing up and has bounced from hoping for the Summer Olympics and then doing an about-face for the Winter Olympics. 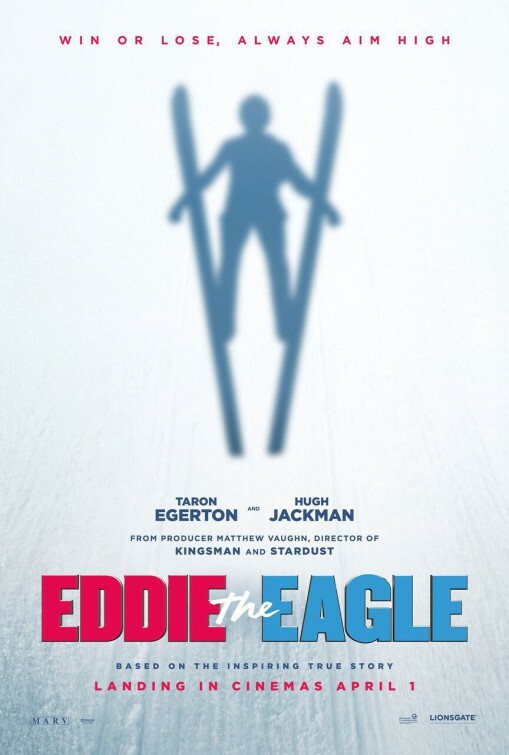 After narrowly missing out on making the British team as a skier, Eddie decides to go for it as a ski jumper…except he’s never tried ski jumping…at all. Eddie moves to a training site in Germany and starts from the ground-up. 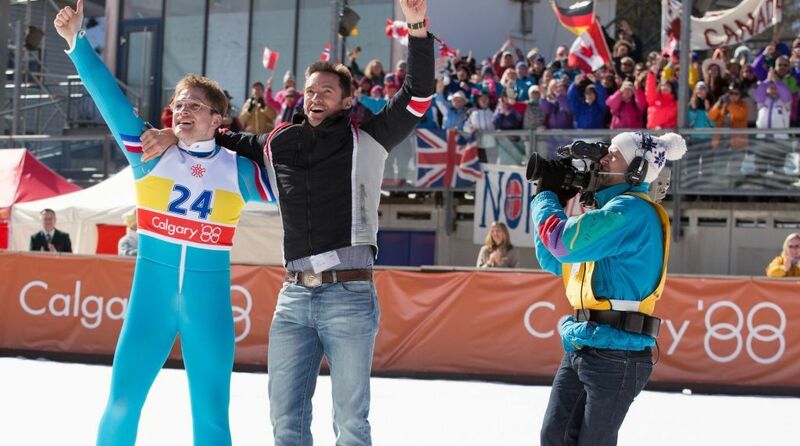 After some painful but affirming jumps, Eddie seeks out the help of Bronson Peary (Hugh Jackman), a former US champion who’s fallen on some hard times. Bronson thinks Eddie is nuts to continue with the training but when he sees his stubborn new student just isn’t going to quit, he gets on-board, hoping to help Eddie from not dying on the slopes. Their biggest goal? Getting Eddie to qualify for the 1988 Calgary Olympics. One piece of advice if you’re going to see this sports-themed story. Don’t read too much about Eddie ‘The Eagle’ Edwards and his story/background. If you feel like ignoring my advice, check it out HERE. I wanted to go in fresh, go in clean – and I enjoyed it that much more because of it. Even if it is a familiar story of an underdog, not knowing exactly where it’s going pays off some big dividends. Have you seen Rudy? Rocky? Cool Runnings? Hoosiers? Countless other flicks I’m missing? If you answered ‘Yes,’ then you know exactly what you’re getting into with ‘Eagle.’ That’s not a bad thing. If you liked those movies, you’ll like/love this story from actor-turned-director Dexter Fletcher. There is simply something charming and reaffirming about underdog sports stories. You can call it clichéd, stereotyped or cheesy, but as a sports and/or movie fan, it will always be fun to see those stories, especially when they’re based on true stories, like here. This story sticks to the truth – mostly – while condensing some parts of Eddie’s life and training for the sake of a streamlined movie. The gist of it is there though, a strong-willed athlete who doesn’t grasp the concept of ‘You can’t’ or ‘You shouldn’t’ because he wants nothing more than to obtain his goal of being an Olympic athlete. Can’t we all get on-board with that? Last seen saving the world from a diabolical mastermind – in “Kingsman: The Secret Service” – Taron Egerton jumps head-first into the titular role of Eddie the Eagle. In a meatier role than “Kingsman”, he gets to show off his range a bit and doesn’t disappoint. For one, he did some work to get Eddie’s look down. Egerton is a good-looking kid but with some poofy hair, a goofy mustache, his glasses, you buy him as a pretty close dead-ringer for the real-life Eddie. Go ahead. Google it. The physical mannerisms, the face scrunch, the physical ticks, the squint, Egerton does a heck of a job. Just as a performance, it’s excellent. It’s likable. It’s sympathetic. ‘Eagle’ hits a home run in the most necessary part of the sports underdog story. You need to like him as a viewer. You need to root for him to achieve his goals. Double-check in that department! Looking forward to what’s next for Egerton, a very talented young actor. What does a good underdog need the most? A tough-talking coach who won’t take no crap! In steps Wolverine himself, Hugh Jackman. His Bronson Pearcy is a combination of Eddie’s real-life coaches so don’t check the history books (or Wikipedia) for his name. Jackman does what he does best, throwing his crazy amounts of energy into the role, providing a great counter to Egerton’s Eddie. His falling out in the ski jumping community left a nasty taste in his mouth but now he has his surprising chance to return. Egerton and Jackman have a pretty perfect chemistry, easy-going, believable and always entertaining together. They play well off each other in a relationship that has its fair share of ups and downs through their training. Pointless but cool tidbit? Egerton and Jackman filmed a greeting that aired before the movie which I thought was a nice touch. Didn’t look scripted or overdone, just two friends talking about a movie they’re proud of being a part of. Pretty cool. Not a huge cast overall, but a good one just the same. Jo Hartley and Keith Allen are excellent as Eddie’s parents, equal parts supportive and frustration as Eddie continues to chase his dream. Christopher Walken has a small part – but a welcome one – as a former coach of Bronson’s who’s a figurehead of sorts in the skiing community. Also look for Tim McInnerny, Edvin Endre, Iris Berben and the then the always welcome as always Jim Broadbent as a BBC TV commentator. “Eagle” follows the familiar formula of the underdog rising to the occasion. We get some training montages set to a fun 1980’s themed soundtrack – the score itself sounds like a cheesy 80’s electronic synth score – and all those nice little touches. My suggestion is simple. Go along for the ride. 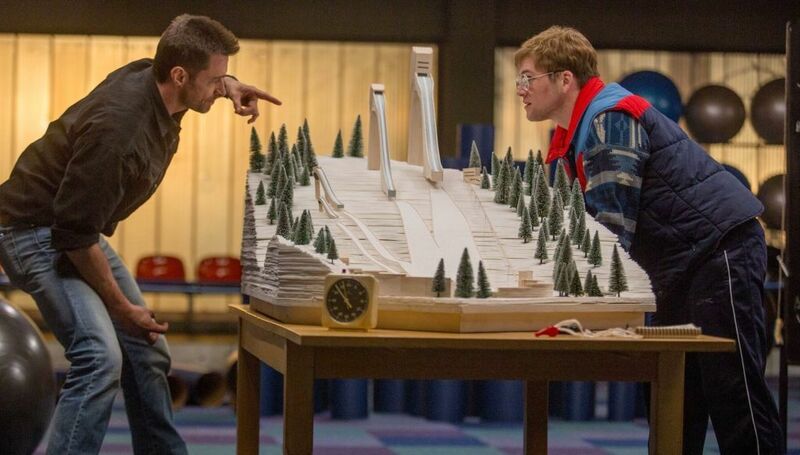 The ski jump footage is obviously CGI at points, but it is fun. Fun. There’s some great moments, especially in the final act as Eddie runs through roadblock after roadblock, one person after another trying to stop him. No spoilers here, but it’s pretty unnecessary. The movie wouldn’t be here if there wasn’t a happy ending. But just because you know where it’s going doesn’t mean you can’t enjoy that ride. That’s what works so well in all sports underdog stories. You know what the end game will be and you still enjoy it. An easy movie to recommend. Give it a shot! ← The 88th Academy Award Winners….